We woke up before sunrise again, which was perfect because we wanted to get an early start. We ate yummy buffet breakfast (but was it yummy?? WAS IT? Cue horror film music), packed, and headed out. 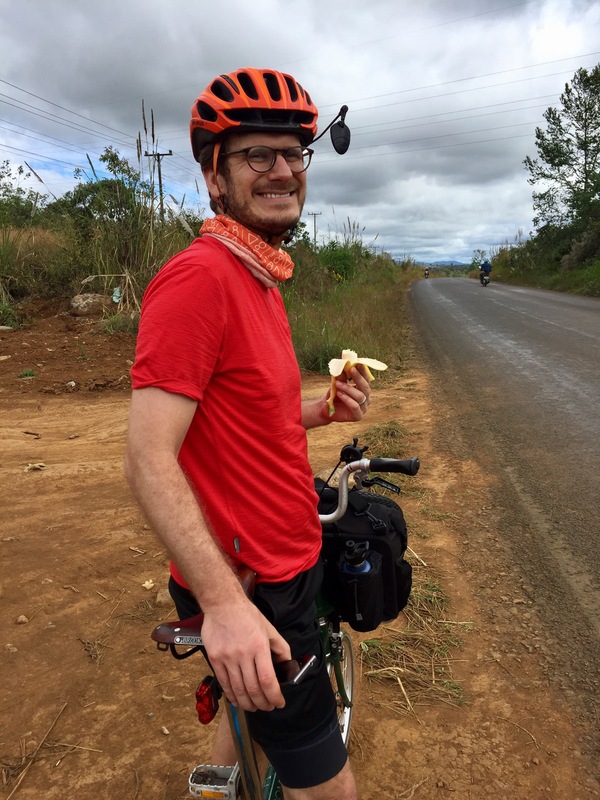 We thought we were at the top of the Plateau at this hotel, but we were wrong – 10 more miles to the top, and a strong headwind to combat on the way. We came across the Tad Fane waterfalls a few miles in, and also the Tad Fane resort, which we have a booking for in 2 nights. Only…it’s in the wrong place. 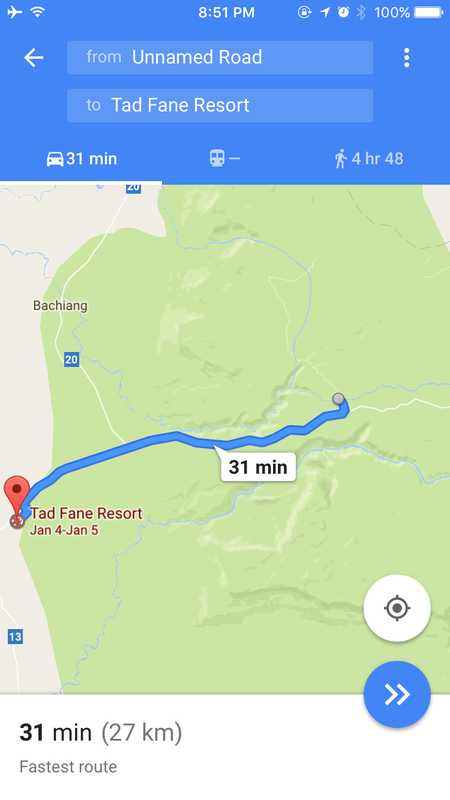 You see, booking.com, maps.me, and google maps all think Tad Fane Resort is 27k down the Plateau from where we stood. We are doing a loop, so it is actually not possible for us to come back up here to stay. I don’t want to climb the plateau again, and we have to catch a flight the day after we were supposed to stay here, so it would be hard for us to cycle 40k in the morning compared to the 13k we expected. Here’s where it is compared to where the world thinks it is, and the white road down from Bachieng is where we’ll come from. So we’re in disputes with booking.com to get free cancellation for this place. 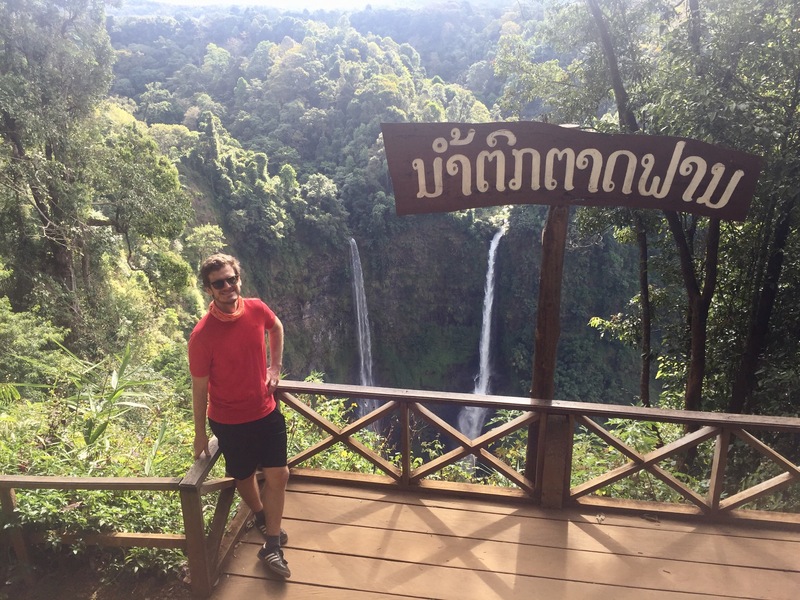 At any rate, it was gorgeous – set in the jungle and the restaurant overlooks a waterfall. We moved along to climb to the top of the plateau. We saw five other cyclists! Two touring and three on day rides. Three were coming the opposite direction, and we were jealous of their luck with the wind. At the top, we rewarded ourselves with lattes, and Ted complained about an upset stomach after we set off again. He blamed it on drinking coffee on an empty stomach. We made a close to 90 degree turn, and the wind seemed to turn with us (aka, still against us). We were finally going downhill, but pedaling hard against the wind! Now for one of the top 10 most awkward (but also wonderful) experiences either of us has ever had. We stopped at what we thought was a restaurant to get noodle soup. It was a giant tent with lots of tables and chairs and people eating. A lot of restaurants here don’t have signs, and in our experience, the restaurants without signs have been the best ones. In retrospect, the tent should have told us it was a temporary situation, but we were hungry and not thinking, I guess. 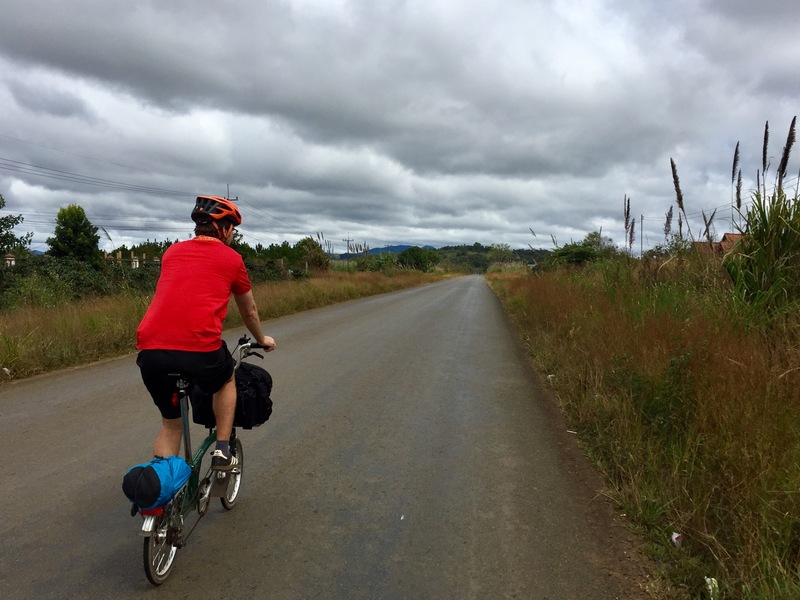 Anyway, we roll up and people are staring at us, as they have at every restaurant we’ve gone to because we’re a couple westerners riding bikes around the Lao countryside. This is legitimately novel, so we’ve come to expect stares. We sat down at a table, and a moment later, a gentleman who speaks very good English comes up to introduce himself and explains that we just sat down at a funeral celebration. Embarrassed, we apologize profusely, get up, and attempt to excuse ourselves, but he says, “no, please join us for lunch!” As awkward as it felt to stay, it felt even more awkward to refuse his invitation, so we sat back down. Soon, a few children brought us out fish soup, Lao Laap, sticky rice, lettuce, clementines, ice, and water. Wow! We ate and talked to this kind man. He is a biology teacher at a teacher’s college in Pakse. He’s Ted’s age, and he taught himself English by reading books written in English and making use of the dictionary. Smart guy, and somehow he’s single! The laap was mostly composed of offals, which are not fun to look at, but taste basically like the animal they came from. Anyway, after we got past the mental block of eating entrails and organs, the food was delicious! We tried to keep the conversation flowing, but we both just felt so embarrassed for imposing on a funeral celebration that we probably weren’t great conversationalists. When it was time to leave, our new friend brought us out a bag of snacks for the road! Everyone has been so incredibly kind on this trip, but this was just so far beyond. The food seemed to accelerate Ted’s stomach issues, though, and the next 10k were rough for him. We got to a coffee resort, and Ted had to spend a lot of time in the restroom as I sipped a latte. Poor guy. It was only 3k to our guesthouse, so we got back on the road and have been hunkered down at a guesthouse for about 6 hours. Ted slept (and did some other things) and seems to be on the mend, but I seem to be following his path, just 12 hours delayed. The only culprit we can identify is that breakfast buffet this morning. It couldn’t be the offals, because Ted was feeling ill prior to that. Falls View resort man, nice rooms and a beautiful setting, but they HAVE to do something about their kitchen.